Kind of late to mention this as we get close to the end of the 2014 NCAA men's college basketball championship games, but Google has made it easy to check on the games in progress and their results. 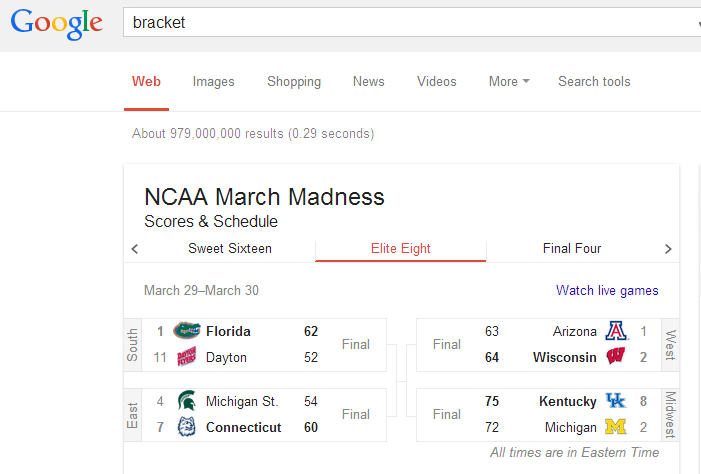 Just type in bracket in Google and get the info at the top of the results page. Best wishes to my alma mater, University of Connecticut. 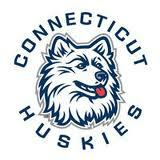 Go UConn Huskies ! Winning the Final game against Butler (53-41), UConn, my alma mater, claimed the men's basketball title for 2011. This despite the fact that expectations for a UConn win weren't so high. Let's not forget that they also won the Bing East title last month. While the women team's dream of another victory didn't materialize this year, there is no denying that they made good effort, and of course their consecutive win record won't be in any danger for quite some time. I haven't been to UConn in years, but I owe a debt of gratitude to the school and its engineering program. Much of the knowledge I learned at UConn is still applicable in my daily job.